THE STRANGEST PLACE ON EARTH? This picturesque ranch in northeastern Utah is the focal point of scientific research into the paranormal. Called the "Strangest Place On Earth" due to its long history of strange and bizarre happenings, the reports continue of anomalous phenomena in this rural section of northeastern Utah. The activity, as reported by hundreds of witnesses over several decades, & possibly centuries, includes UFOs, unusual balls of light, animal mutilations and disappearances, poltergeist events, sightings of Bigfoot-like creatures, living dinosaurs, and other unidentified animals, physical effects on plants, soil, animals and humans, strange ice circles, magnetic anomalies, and a vast array of other unexplained incidents. The area is also noted to have a Vortex or Portal where doorways to other realms or dimensions are seen as glowing tubes, and random holes or rips in the sky. NIDS after buying the Sherman ranch, where it seems the activity is concentrated, installed video cameras and other sensitive monitoring equipment, built new fencing and constructed observation posts manned with trained observers, in hopes of collecting evidence for scientific study. But to this day NIDS says publicly, that none of the phenomenon occurring there has been recorded, even though the NIDS scientists have seen the balls of light, unknown creatures and UFOs, and mutilated animals. A "pre-cognitive intelligence" roams here", & the phenomena seems to play with and test the NIDS researchers courage and ability to 'record' or observe the activity or unknown events. One NIDS scientist says, "It isn't as simple as saying that ET's or flying saucers are doing it. It's some kind of consciousness, but it's always something new and different, something non- repeatable. It's reactive to people and equipment, and we set up the ranch to be a proving ground for the scientific method, but science doesn't seem amenable to the solution of these kinds of problems." The NIDS Ranch borders Indian land and is known to the local Indians as "unholy ground" where a shape-shifting creature called the "Skinwalker" is said to lurk in its various forms and natural doorways to other worlds or dimensions are known to exist. The Ranch is currently owned by Robert Bigelow or NIDS and is Private Property. NIDS does not want you there, its guarded and under electronic surveillance. Trespassers will be prosecuted. -Note: The Ranch is to be considered dangerous & unpredictable, attempting to enter the Ranch puts your safety at risk.... and you'll just get arrested for trespassing. The Ranch is located in Utah's Uinta Basin an area with a long history of UFO sightings. Some of which have been published in a book called "The Utah UFO Display" by Junior Hicks. The Uinta Mountains are also unique, being the most predominant mountain range in North America that lies in a East -West direction. "SHeRmaN RaNcH" which is also known as "Utah's UFO RaNcH"
"NIDS Mystery Ranch" "Bigelow Ranch" "Haunted Ranch" "Ghost Ranch" "Paranormal Ranch" "Skinwalker Ridge" & "UFO Hill"
recently called the "Gorman Ranch" for some reason, likely an attempt to hide the former owners identity. UUFOH has the largest known data base of information on the NIDS Ranch available to the public anywhere on the net. Including uncensored and exclusive photos, reports, original articles, information, and artwork. RaNcH since they took over in 1996.
also with the extreme level of paranormal activity, unknown and possibly dangerous creatures, intelligence's, etc. said to roam there, it is not recommended, its best to keep your distance. a telephone interview originating on Sunday June, 30 1996 went on Art Bell 90 minutes later. This was the first trading post in Utah, originally called the Reed Trading Post, ownership was transferred to Antoine Robidoux in the 1830's. For Robidoux or Fort Winty, as it was sometimes called, served as an unsavory rendezvous, trading post, fort, and traveler's stop until 1844 when the post was burned to the ground and all white males were killed by the enraged Utes. Robidoux's absence saved him from this fate. An Indian agency was established near there from 1869-1912 when offices were moved to Fort Duchesne. Whiterocks Village, a prehistoric settlement was excavated by the University of Utah in 1966. A number of structures were unearthed as well as large quantities of cultural debris. Evidence indicated occupation by Fremont Culture about 850 A.D. It is listed as a historic site. It is not open to the public and little remains there. Permission to go onto this land must be granted by the Ute tribe. 4"The Strip" was a triangular shaped piece of land, just east of Fort Duchesne, that was purchased from the Indians by a mining company. There was no law or authority to govern this piece of land and this little town quickly turned into a reckless and unlawful vice. Many killings took place there. The closest city was Boothill, located on the red bluff about 1 ½ miles away. The story has it that Butch Cassidy, who frequented this area, was seen there after he was supposedly killed in South AmericaCredit: Mark Woody. 4The Ranch purchased (for a purported $230,000) a "Haunted Ranch" in Utah where UFO attacks, creature sightings and "Interdimensional Portals" had shown up, in the wake of mysterious "Cattle Mutilations." In Fort Duchesne, Utah, ranchers Terry and Gwen Sherman swear their property is being frequented by UFOs. The Sherman's and their children report seeing three kinds of craft in the last 15 months - a small, boxlike object about 8 feet long, a 40-foot-long variety and a ship the size of several football fields. Terry said he once heard male voices speaking an unfamiliar language. The voices seemed to be about 25 feet above him, but he couldn't see a thing. Local UFO expert Joseph "Junior" Hicks told the Idaho Falls Post-Register, "I think primarily it's research and exploration." 4Page 3 - ROBERT BIGELOW - This page has information on 'Bob' Bigelow. 4 Page 6 - UUFOH RANCH RECON 2003 - EXCLUSIVE 2003 PHOTOS! 4 Page 8 - Unidentified Animal Update connection with the blue chupa? - Over 20 Articles! - Over 50 Photos! - Plus Artwork & Exclusives! 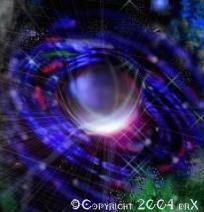 Paranormal Activity and stories of Vortexes or Portals that would open up on the ranch. 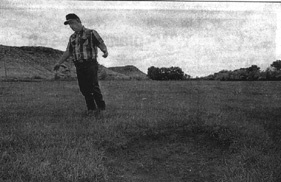 Terry Sherman former owner, showing mysterious holes or depressions that would appear overnight on the ranch. The soil taken from these spots were never found.